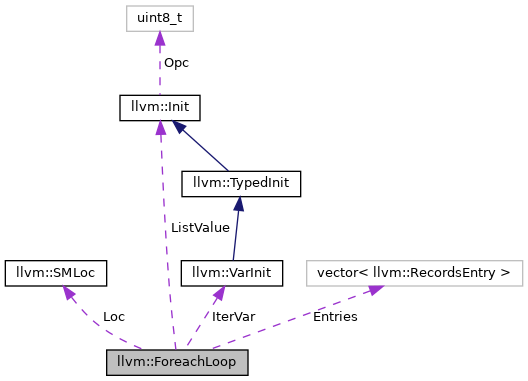 ForeachLoop - Record the iteration state associated with a for loop. This is used to instantiate items in the loop body. Definition at line 59 of file TGParser.h. Definition at line 67 of file TGParser.h. Definition at line 63 of file TGParser.h. Definition at line 61 of file TGParser.h. Definition at line 62 of file TGParser.h. Definition at line 60 of file TGParser.h.